Alabama is a state located in the southern region of the United States of America. Alabama ranks 30th in total land area and ranks second in the size of its inland waterways. The state ranks 23rd in population with approximately 4.6 million residents in 2006. Like other states in the South, Alabama is burdened by the legacy of slavery and racial segregation, a pattern that lasted until the civil rights movement and federal legislation forced changes. African Americans were not the only residents of Alabama to suffer at the hands of racism. Cherokee and other Native Americans who occupied land in Alabama were forcibly removed in 1838 and forced to trek more than 1,000 miles to Indian Territory in present-day Oklahoma. In 2007, the Alabama state legislature passed a resolution expressing "profound regret" over slavery and its lingering impact. While this is a positive step, it has yet to acknowledge its wrongful treatment of the Cherokee people. From the American Civil War until World War II, Alabama, like many southern states, suffered economic hardship, in part because of continued dependence on agriculture. In the years following World War II, Alabama experienced significant recovery as the economy of the state transitioned from agriculture to diversified interests in heavy manufacturing, mining, education, and high technology. Someday Alabama may surpass Michigan and become the largest automobile manufacturer in North America. Although Alabama's public education system has improved in recent years, it still lags behind other states, ranking second lowest in the United States for high school graduation. The Native American Alabama, a Muskogee tribe, which resided just below the confluence of the Coosa and Tallapoosa Rivers on the upper reaches of the Alabama River, served as the etymological source of the names of the river and state. The word Alabama is believed to have originated from the Choctaw language and was later adopted by the Alabama tribe as their name. Alabama terrain map: shows lakes, rivers, roads, with Mount Cheaha (right center) east of Birmingham. The states bordering Alabama include Tennessee to the north; Georgia to the east; Florida to the south; and Mississippi to the west. Alabama has coastline at the Gulf of Mexico, in the extreme southern edge of the state. 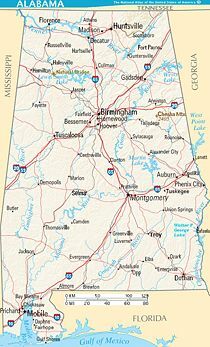 Alabama is the 30th largest state in the United States with 52,423 square miles (135,775 km²) of total area: 3.19 percent of the area is water, making Alabama 23rd in the amount of surface water, also giving it the second largest inland waterway system in the United States. About three-fifths of the land area is a gentle plain with a general descent toward the Mississippi River and the Gulf of Mexico. The North Alabama region is mostly mountainous, with the Tennessee River cutting a large valley creating numerous creeks, streams, rivers, mountains, and lakes. A notable natural wonder is a natural bridge that is the longest east of the Rockies, located just south of the town of Haleyville. Alabama generally ranges in elevation from sea level at Mobile Bay to over 1,800 feet (550 m) in the Appalachian Mountains in the northeast. The highest point is Mount Cheaha, at a height of 2,407 ft (733 m). A 5-mile (8 km)-wide meteorite impact crater is located in Elmore County, just north of Montgomery. This is the Wetumpka crater, which is the site of "Alabama's greatest natural disaster." A 1,000-foot (300 m)-wide meteorite hit the area about 80 million years ago. Though winters in the state are usually mild, nightly freezing occurs frequently in the north. The climate of Alabama is described as temperate with an average annual temperature of 64°F (18 °C). Temperatures tend to be warmer in the southern part of the state with its close proximity to the Gulf of Mexico, while the northern parts of the state, especially in the Appalachian Mountains in the northeast, tend to be slightly cooler. 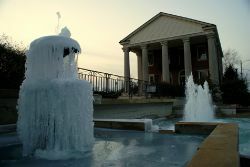 Generally, Alabama has very hot summers and mild winters with copious precipitation throughout the year. Alabama receives an average of 56 inches (1,400 mm) of rainfall annually and enjoys a lengthy growing season of up to 300 days in the southern part of the state. Snow is a rare event in much of Alabama. Areas north of Montgomery may receive a dusting a few times every winter, with a moderately heavy snowfall every few years. In the southern Gulf coast, snowfall is less frequent. Alabama is also prone to tropical storms and hurricanes. Areas of the state far from the Gulf are not immune to the effects of the storms, which often dump tremendous amounts of rain as they move inland and weaken. South Alabama reports more thunderstorms than any part of the United States. Tornadoes are common throughout the state, although the peak season varies from the northern to southern parts of the state. Alabama shares the dubious distinction, with Kansas, of having reported more F5 tornadoes (the most powerful) than any other state for the period January 1, 1950 to October 31, 2006. The northern part of the state – along the Tennessee Valley – is one of the areas in the country most vulnerable to violent tornadoes. 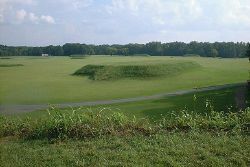 Modern-day view of the Moundville Archaeological Site in Alabama. Trail of Tears, Cherokee removal routes in the 1830s. Among the Native American people once living in the area of present-day Alabama were Alabama (Alibamu), Cherokee, Chickasaw, Choctaw, Creek, Koasati, and Mobile. Trade with the Northeast via the Ohio River began during the Burial Mound Period (1000 B.C.E.-700 C.E.) and continued until European contact. The agrarian Mississippian culture covered most of the state from 1000 to 1600 C.E., with one of its major centers being at the Moundville Archaeological Site in Moundville, Alabama. The French founded the first European settlement in the state with the establishment of Mobile in 1702. Southern Alabama was French from 1702 to 1763, part of British West Florida from 1763 to 1780, and part of Spanish West Florida from 1780 to 1814. Northern and central Alabama was part of Georgia from 1763 to 1783 and part of the American Mississippi territory thereafter. Its statehood was delayed by the lack of a coastline, a situation rectified when Andrew Jackson captured Spanish-held Mobile in 1814. 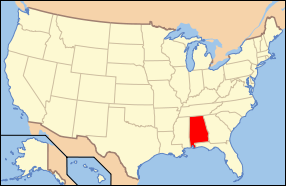 Alabama was the twenty-second state admitted to the Union, in 1819. Conflict between the Indians of Alabama and American settlers increased rapidly in the early nineteenth century. The great Shawnee chief Tecumseh visited the region in 1811, seeking to forge an Indian alliance of resistance from the Gulf of Mexico to the Great Lakes. With the outbreak of the War of 1812, Britain encouraged Tecumseh's resistance movement. Several tribes were divided in opinion, and the Creek tribe fell into civil war. Violence between Creeks and Americans escalated, culminating in the Fort Mims massacre. Full-scale war between the United States and the "Red Stick" Creeks began, known as the Creek War. The Chickasaw, Choctaw, Cherokee, and other Creek factions remained neutral or allied to the United States, some serving with American troops. Volunteer militias from Georgia, South Carolina, and Tennessee marched into Alabama, fighting the Red Sticks. Later, federal troops became the main fighting force for the United States. General Andrew Jackson was the commander of the American forces during the Creek War and later against the British. The treaty of Fort Jackson on August 9, 1814 ended the Creek War. By the terms of the treaty the Creeks, Red Sticks and neutrals alike, ceded about one-half of the present state of Alabama. Later cessions by the Cherokee, Chickasaw, and Choctaw in 1816 left only about a quarter of Alabama to the tribes. In 1830 the Indian Removal Act set in motion the process that resulted in the Indian removal of southeastern tribes, including the Creek, Cherokee, Choctaw, Chickasaw, and Seminole. In 1832, the national government provided for the removal of the Creeks via the Treaty of Cusseta. These Native American tribes were relocated to Indian Territory (modern-day Oklahoma) via the 1200-mile trek known as the Trail of Tears. Before the actual removal occurred between 1834 and 1837, the state legislature formed the Indian lands into counties, and settlers flocked in. Alabama was the new frontier in the 1820s and 1830s. Settlers rapidly arrived to take advantage of fertile soils. Planters brought slaves with them, and traders brought in more as the cotton plantations expanded. The economy of the central "Black Belt" (so-named for the dark, fertile soil) featured large cotton plantations whose owners built their wealth on the labor of enslaved African-Americans. Elsewhere poor whites were subsistence farmers. According to the 1860 census, enslaved Africans comprised 45 percent of the state's population of 964,201. There were only 2,690 free persons of color. Alabama is unofficially nicknamed the Yellowhammer State, after the state bird, and is also known as the "Heart of Dixie"
In 1861 Alabama seceded from the Union to join the Confederate States of America. While not many battles were fought in the state, Alabama contributed about 120,000 soldiers to the Civil War. All the slaves were freed by 1865. Following Reconstruction, Alabama was readmitted to the Union in 1868. After the Civil War, the state was still chiefly rural and its economy tied to cotton. Planters resisted working with free labor and sought to re-establish controls over African Americans. Whites used paramilitary groups, Jim Crow Laws, and segregation to reduce the freedoms of African Americans and restore their own dominance. In its new constitution of 1901, the elite-dominated legislature effectively disfranchised African Americans through voting restrictions. While the planter class had engaged poor whites in supporting these efforts, the new restrictions resulted in disfranchising poor whites as well. By 1941 more whites than blacks had been disfranchised, due mostly to the effects of the cumulative poll tax. The damage to the African-American community was more pervasive, as nearly all its citizens lost the ability to vote. The shutout was long-lasting. The disfranchisement was ended only by federal legislation in the mid-1960s intended to protect their voting and civil rights. Such legislation also protected the rights of poor whites. The rural-dominated legislature continued to underfund schools and services for African Americans in the segregated state but did not relieve them of paying taxes. Continued racial discrimination, agricultural depression, and the failure of the cotton crops due to boll weevil infestation led tens of thousands of African Americans to seek out opportunities elsewhere. They left Alabama in the early twentieth century as part of the Great Migration to industrial jobs and better futures in northern industrial cities. The rate of population growth rate in Alabama dropped by nearly half in the decade from 1910 to 1920, reflecting the outmigration. At the same time, many rural whites and blacks migrated to the city of Birmingham for work in new industrial jobs. It experienced such rapid growth that it was nicknamed "The Magic City." By the 1920s, Birmingham was the nineteenth largest city in the United States and held more than 30 percent of the population of the state. Heavy industry and mining were the basis of the economy. One result was that Jefferson County, home of Birmingham's industrial and economic powerhouse, contributed more than one-third of all tax revenue to the state, yet it received back only 1/67th of the tax money, as the state legislature ensured that taxes were distributed equally to each county, regardless of population. Urban interests were consistently underrepresented. Because of the disfranchisement of African Americans, the state continued as one-party Democratic for decades. Industrial development related to the demands of World War II brought prosperity. Cotton faded in importance as the state developed a manufacturing and service base. Then in 1955, Rosa Parks refused to move to the back of a Montgomery city bus, triggering a bus boycott that blossomed into the civil rights movement, including the Selma to Montgomery marches in 1965. Under Governor George Wallace, many whites in the state opposed integration efforts, but the passage of the Voting Rights Act of 1965 opened the way for more blacks to vote. Under the Voting Rights Act, cases were filed in federal courts to force Alabama to properly redistrict by population both the state House and Senate. In 1972, for the first time since 1901, the Alabama constitution's provision for periodic redistricting based on population was implemented. This benefited the many urban areas that had developed in the interim. After 1972, the state's white voters shifted much of their support to Republican candidates in presidential elections (as also occurred in neighboring southern states). Since 1990 the majority of whites in the state have also voted increasingly Republican in state elections. 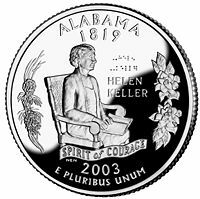 Alabama's quarter depicting famous resident Helen Keller along with the longleaf pine branch and Camellia blossoms from the 50 State Quarters program. Released March 19, 2003. According to the United States Bureau of Economic Analysis, the 2006 total gross state product was $160 billion, or $29,697 per capita for a ranking of 44th among states. Alabama's GDP increased 3.1 percent from 2005, placing Alabama number 23 in terms of state-level GDP growth. The single largest increase came in the area of durable goods manufacturing. In 1999, per capita income for the state was $18,189. Alabama's agricultural outputs include poultry and eggs, cattle, plant nursery items, peanuts, cotton, grains such as corn and sorghum, vegetables, milk, soybeans, and peaches. Although known as "The Cotton State," Alabama ranks between eight and ten in national cotton production, according to various reports, with Texas, Georgia and Mississippi comprising the top three. Alabama's industrial outputs include iron and steel products (including cast-iron and steel pipe); paper, lumber, and wood products; mining (mostly coal); plastic products; cars and trucks; and apparel. Also, Alabama produces aerospace and electronic products, mostly in the Huntsville area, which is home of the NASA George C. Marshall Space Flight Center and the US Army Missile Command, headquartered at Redstone Arsenal. Alabama is also home to the largest industrial growth corridor in the nation, including the surrounding states of Tennessee, Mississippi, Florida, and Georgia. Most of this growth is due to Alabama's rapidly expanding automotive manufacturing industry. In Alabama alone since 1993, it has generated more than 67,800 new jobs. Alabama currently ranks second in the nation behind Detroit in automobile output. With recent expansions at sites in Alabama, by early 2009 the state will surpass Detroit and become the largest builder of automobiles in North America. In the 1970s and 1980s, Birmingham's economy was transformed by investments in biotechnology and medical research at the University of Alabama at Birmingham (UAB) and its adjacent hospital. The UAB Hospital is a Level I trauma center providing health care and breakthrough medical research. UAB is now the area's largest employer and the largest in Alabama, with a workforce of about 20,000. Health-care services provider HealthSouth is also headquartered in the city. Birmingham is also a leading banking center, serving as home to two major banks: Regions Financial Corporation and Compass Bancshares. SouthTrust, another large bank headquartered in Birmingham, was acquired by Wachovia in 2004. The city still has major operations as one of the regional headquarters of Wachovia. In November 2006, Regions Financial merged with AmSouth Bancorporation, which was also headquartered in Birmingham. They formed the eighth largest U.S. bank (by total assets). In 2008 Wachovia was acquired by Wells Fargo. Nearly a dozen smaller banks are also headquartered there. Telecommunications provider AT&T, formerly BellSouth, has a major presence with several large offices in the metropolitan area. Major insurance providers are headquartered in Birmingham and employ a large number of people. The city is also a powerhouse of construction and engineering companies. The city of Mobile, Alabama's only saltwater port, is a busy seaport on the Gulf of Mexico with inland waterway access to the Midwest via the Tennessee-Tombigbee Waterway. The Port of Mobile is the tenth largest by tonnage in the United States. In May 2007, a site north of Mobile was selected by German steelmaker ThyssenKrupp for a $3.7 billion steel production plant, with the promise of 2,700 permanent jobs. 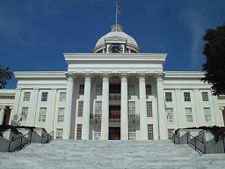 The Alabama State Capitol in Montgomery, built in 1850. 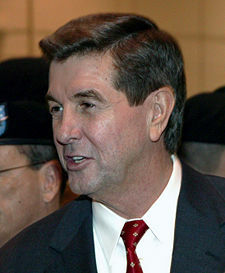 Alabama Governor Bob Riley, 2004. Montgomery is the capital, second most populous city, and the 4th most populous metropolitan area in Alabama, and is the county seat of Montgomery County. It is located southeast of the center of the state, in the Gulf Coastal Plain. The city was incorporated in 1819, as a merger of two towns situated along the Alabama River. It became the state capital in 1846. In February 1861, Montgomery was selected as the first capital of the Confederate States of America, until the seat of government moved to Richmond, Virginia in May of that year. The foundational document for Alabama's government is the Alabama Constitution, which was ratified in 1901. It is the world's longest constitution and is roughly forty times the length of the U.S. Constitution. There is a significant movement to rewrite and modernize Alabama's constitution, which has been amended over 800 times. This movement is based upon the fact that Alabama's constitution highly centralizes power in Montgomery and leaves practically no power in local hands. Any policy changes proposed around the state must be approved by the entire Alabama legislature and, frequently, by state referendum. One criticism of the current constitution claims that its complexity and length were intentional to codify segregation and racism. Alabama is divided into three equal branches: The legislative branch consists of the House of Representatives, with 105 members, and the Senate, with 35 members. The executive branch is headed by the governor Other members of the executive branch include the cabinet, the attorney general, the secretary of state, the commissioner of agriculture and industries, the state treasurer, and the state auditor. The highest court is the Supreme Court of Alabama. Alabama has 67 counties. Each county has its own elected legislative branch, usually called the County Commission, which usually also has executive authority in the county. Due to the restraints placed in the Alabama Constitution, all but seven counties (Jefferson, Lee, Mobile, Madison, Montgomery, Shelby, and Tuscaloosa) in the state have little to no home rule. Instead, most counties in the state must lobby the Local Legislation Committee of the state legislature to get simple local policies such as waste disposal to land use zoning. The Democratic Party currently holds a large majority in both houses of the legislature. Due to the legislature's power to override a gubernatorial veto by a mere simple majority (most state legislatures require a two-thirds majority to override a veto), the relationship between the executive and legislative branches can be easily strained when different parties control the branches. With the disfranchisement of African-Americans, the state became part of the "Solid South," a one-party system in which the Democratic Party became essentially the only political party in every Southern state. For nearly 100 years, local and state elections in Alabama were decided in the Democratic Party primary, with generally only token Republican challengers. In the 1986 Democratic primary election, the then-incumbent lieutenant governor lost the Democratic nomination for governor. The state Democratic Party invalidated the election and placed the lieutenant governor's name on the ballot as the Democratic candidate instead of the candidate chosen in the primary. The voters of the state revolted at what they perceived as disenfranchisement of their right to vote and elected Republican challenger Guy Hunt. This was the first Republican governor elected in Alabama since Reconstruction. Since then, Republicans have been increasingly elected to state offices until in 2006 Democrats were barely holding a majority in the state legislature. Since 1986, only one Democrat, Don Siegelman, has managed to win the governor's office. A corruption probe and eventual trial, the timing of which coincided with the 2006 state primary, relegated Siegelman to one term. Alabama state politics gained nationwide and international attention in the 1950s and 1960s during the American Civil Rights Movement, when majority whites bureaucratically, and at times violently, resisted protests for electoral and social reform. George Wallace, the state's governor during that period, remains a notorious and controversial figure. Only with the passage of the Civil Rights Act of 1964 and the Voting Rights Act of 1965 did African Americans regain suffrage and other civil rights. In 2007, the Alabama legislature passed, and the governor signed, a resolution expressing "profound regret" over slavery and its lingering impact. In a symbolic ceremony, the bill was signed in the Alabama State Capitol, which housed the Congress of the Confederate States of America. From 1876 through 1956, Alabama supported only Democratic presidential candidates, by large margins. 1960 was a curious election. The Democrats won with John F. Kennedy on the ballot, but the Democratic electors from Alabama gave 6 of their 11 electoral votes as a protest to Harry Byrd. In 1964, Republican Barry Goldwater carried the state, in part because of his opposition to the 1964 Civil Rights Act, which restored the franchise for African Americans. In the 1968 presidential election, Alabama supported native son and American Independent Party candidate George Wallace over both Richard Nixon and Hubert Humphrey. In 1976, Democratic candidate Jimmy Carter from Georgia carried the state, the region, and the nation, but Democratic control of the region slipped after that. Since 1980, conservative Alabama voters have increasingly voted for Republican candidates at the federal level, especially in presidential elections. By contrast, Democratic candidates have been elected to many state-level offices and comprise a long-standing majority in the Alabama legislature. In 2004, George W. Bush won Alabama's nine electoral votes by a margin of 25 percentage points with 62.5 percent of the vote, mostly white voters. The eleven counties that voted Democratic were Black Belt counties, where African-Americans are the majority racial group. In the U.S. House of Representatives, the state is represented by seven members, five of whom were Republicans in 2008. 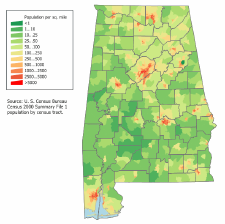 As of 2005, Alabama had an estimated population of 4,557,808, which is an increase of 32,433, or 0.7 percent, from the prior year and an increase of 110,457, or 2.5 percent, since the year 2000. The state had 108,000 foreign-born (2.4 percent of the state population), of which an estimated 22.2 percent were illegal immigrants (24,000). The largest reported ancestry groups in Alabama are: African American (26.0 percent), American (17.0 percent), English (7.8 percent), Irish (7.7 percent), German (5.7 percent), and Scots-Irish (2.0 percent). Alabama is located in the middle of what is known as the Bible Belt. The Mobile area is notable for its large percentage of Roman Catholics, owing to the area's early history under French and Spanish rule. Today, a large percentage of Alabamians identify themselves as Protestants. The top two largest denominations in the state are the Baptists (40 percent) and Methodists (10 percent). Well-known people from Alabama include Ralph Abernathy, Hank Aaron, Tallulah Bankhead, Charles Barkley, Hugo L. Black, Truman Capote, George Washington Carver, Nat King Cole, Angela Davis, Zelda Fitzgerald, William C. Handy, Bo Jackson, Helen Keller, Coretta Scott King, Harper Lee, Joe Louis, Willie Mays, John Hunt Morgan, Jim Nabors, Jesse Owens, Rosa Parks, Satchel Paige, Condoleezza Rice, Bart Starr, George Wallace, Booker T. Washington, Billy Williams and Hank Williams, among others. Public school funding is appropriated through the Alabama Legislature through the Education Trust Fund. In FY 2006–2007, Alabama appropriated $3,775,163,578 for primary and secondary education. That represented an increase of $444,736,387 over the previous fiscal year. In 2007, over 82 percent of schools made adequate yearly progress (AYP) toward student proficiency under the national No Child Left Behind law. In 2004, only 23 percent of schools met AYP. Although Alabama's public education system has improved, it still lags behind in achievement compared to other states. According to U.S. census data, Alabama's high school graduation rate—75 percent—is the second lowest in the United States (after Mississippi). 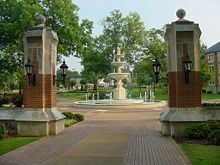 Alabama's programs of higher education include 14 four-year public universities, numerous two-year community colleges, and 17 private, undergraduate, and graduate universities. These include Tuskegee University, a private, historically black university located in Tuskegee, whose first president was Dr. Booker T. Washington. Alabama's median family income is well below the national average. While economic trends in the urban areas are strong, rural poverty is prevalent, skewing the figures downward. Iron, steel, and paper mills, along with automobile manufacturing, biotechnology, banking and telecommunications industries add to the state's economies. The state's low property taxes result in weak funding for healthcare and hospitals, welfare, highways, and education. Teachers’ salaries are among the lowest in the country, though they've been rising in recent years. Alabama's rate of violent crimes peaked in the early 1990s before beginning to decline, however the state's prisons are overpopulated. Drug-related offenses are on the rise. Typically, Alabama has one of the highest murder rates per capita. Metropolitan area schools receive more attention than do rural schools. Fewer health and medical resources are available in the rural and minority communities, and educational and economic opportunities are poor. Some rural areas are plagued with high rates of infant mortality. Even with a high incidence of rural poverty, welfare payments in Alabama rank low by national standards. While there is economic opportunity in Alabama's metropolitan areas, its rural areas are in dire need of attention. This is one area the state's leadership needs to focus on in order to truly provide good governance. ↑ 2.0 2.1 2.2 Elevations and Distances in the United States. United States Geological Survey (2001). Retrieved October 21, 2011. ↑ William Alexander Read and James B. McMillan, Indian Place Names in Alabama (University of Alabama Press, 1984, ISBN 081730231X). ↑ US Census Bureau. United States—States; and Puerto Rico Retrieved October 17, 2008. ↑ Glynn Wilson, The New South Rises, Again: Alabama Gets Its First 'New South' Governor The Southerner (Spring 1999). Retrieved October 17, 2008. ↑ Bureau of Economic Analysis, Gross Domestic Product (GDP) by State, 2006 Retrieved October 17, 2008. ↑ United States Census Bureau, State and County Quick Facts Retrieved October 17, 2008. ↑ U.S. Army Corps of Engineers, Tonnage for Selected U.S. Ports in 2006 Retrieved October 17, 2008. ↑ Manuel Roig-Franzia, [Alabama Vote Opens Old Racial Wounds The Washington Post, November 28, 2004. Retrieved October 17, 2008. ↑ Alabama Citizens for Constitutional Reform, So what's wrong with Alabama's constitution? Retrieved October 17, 2008. ↑ Phillip Rawls, "Alabama offers an apology for slavery." The Virginian Pilot, June 1, 2007. ↑ 18.0 18.1 Alabama Department of Education, Alabama Education Quick Facts 2007 Retrieved October 21, 2008. ↑ Alabama Department of Education, Eighty-Two Percent of Alabama Schools Make AYP While Increasing Annual Measurable Objectives Retrieved October 21, 2008. ↑ US Census Bureau, Educational Attainment: 2000. Retrieved October 21, 2008. Access Genealogy, Indian Tribal Records. Alabama Indian Tribes Retrieved October 17, 2008. Rogers, William Warren. Alabama: The History of a Deep South state. Tuscaloosa, AL: University of Alabama Press, 1994. ISBN 0817307125. Walthall, John A. Prehistoric Indians of the Southeast Archaeology of Alabama and the Middle South. Tuscaloosa, AL: University of Alabama Press, 1980. ISBN 9780585273037. All Links retrieved February 23, 2016. This page was last modified on 15 February 2019, at 22:58.